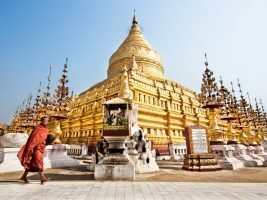 The Dhammayangyi Temple is the largest temple and the one of four major Bagan monuments, and ranks alongside Shwezigon Pagoda, Ananda Temple and Thatbyinnyu Temple in importance. 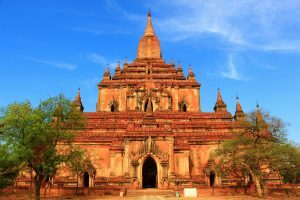 Dhammayangyi Temple was built in 1167 by King Narathu. Its pyramid shape was constructed by fitting bricks together so tightly that there was no need for mortar; on the King’s orders, any worker who failed to adhere to these guidelines had his hands cut off. 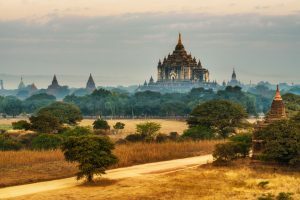 According to Burmese Chronicles, while the construction was in the process, the king was assassinated by some Indians and thus the temple was not completed. 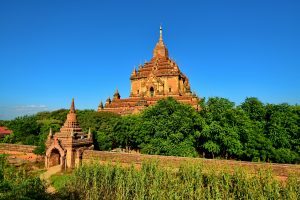 Location: East of Shinbinthalaung and Shwesandaw in the region of Old Bagan.